San Francisco's Counting Crows march -- rock -- to a different drummer. Very different. In September 1993 they opened for Bob Dylan and filled in for Van Morrison at the Rock and Roll Hall of Fame induction ceremony -- before they had even released their first album, August and Everything After. This auspicious beginning was followed by a 93-week chart run, MTV's Best New Artist in a Video Award (1994), an American Music Award for Favorite Artist, Alternative Music (1995), Best MTV/Yahoo Band Website (1996) and, at the end of last year, they became the first band to perform on David Letterman's show on two consecutive nights. In view of these accomplishments, conventional wisdom screams out, "If it ain't broke, don't fix it!" and "Don't mess with success! ", advice most bands would not dare contradict. Counting Crows clearly ain't most bands. "Most of the last tour we didn't play our biggest hit, 'Mr. Jones,'" says rhythm guitarist and founding member David Bryson over the phone. "The original meaning of the song got lost for Adam [Duritz, vocalist]... to be dreaming about being a big star because he had become one. So he's changed the lyrics subtly, and we've (substantially) changed the arrangement. People don't recognize it at first. It's taken on more of a sad tone, about missing his friend, Mr. Jones, who is a buddy he doesn't see much anymore." How have audiences reacted? "We either catch a hard time for it or people praise us for it. The critics can't seem to make up their mind whether it's a cool thing... to be creative... or is just confusing." Bryson's reaction? "It's a totally wonderful thing." If you're a fan and it turns out you don't like the results, at least you gotta like the attitude. 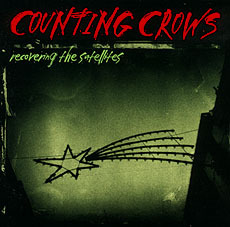 It's not surprising, therefore, that when it came time to record their second album, Recovering the Satellites, Counting Crows opted for the risk of working with a new producer, Gil Norton, despite the fact that the contributions of original producer, T-Bone Burnett, helped them go six-times platinum in the U.S. and seven-times platinum in Canada. According to Bryson, "The band kind of changed its sound from touring so much. We started playing a little harder. Instead of working with T-Bone again, who would have pulled us back toward the first album, we thought we'd maybe exaggerate the whole thing. Move on and do something new." That 'something new' includes lyrics from Duritz that reflect his ongoing not always enjoyable, but always very personal, reaction to the above-mentioned phenomenal success and the changes it engendered. It also sees keyboardist Charlie Gillingham "manipulating a classic instrument, his B3 Hammond, and running it through guitar effects" and Bryson picking up the dobro and familiarizing himself with its non-standard tuning, an experience he describes as "like walking on a high wire and about to fall off." 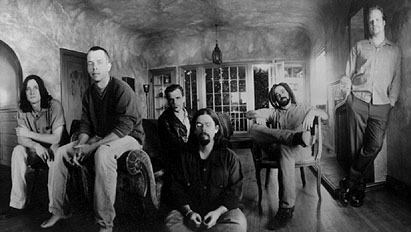 While reactions to the October 1996 release of the second album have been mixed, the band apparently has no regrets over the risks they take, so those who experienced shows from their earlier tours can expect even more change than is apparent on the album when the band plays Vancouver's Orpheum Theatre on March 31. "Adam's idea is to make it fresh," cautions Bryson. "Otherwise it's just going through the motions. This attitude rubs off on us. Friends who haven't seen us since the last tour have all been shocked. The show is a lot more exciting than it has ever been. We rock harder. It's a louder experience. In the past we weren't a soloing band and now we're learning how to fill in around Dan [Vickrey, lead guitar] the way we do around Adam... to be more dynamic and make things move." And lest the purists panic, "There's still a part every night when we come down and do few acoustic things, just because that's a part of us, too." With which our all too brief conversation ends. There is a welcome postscript, however, for Counting Crows fans who surf the web: "There's a lot of people that want to interact with the band. We're actually trying to get laptops for all the band members so we can get more involved, log on, make comments about shows and generally what's happening." In the interval, their award-winning website can be found at http://www.countingcrows.com.